When Grisoft took ewido anti-malware over from ewido networks it was suspected that they would take this useful application to new heights. Grisoft revamped the user interface, added a couple of handy features and renamed the product to ewido anti-spyware. Not long after this they decided to incorporate ewido anti-spyware into the Grisoft range of products. This is when it got the name of AVG Anti-Spyware. 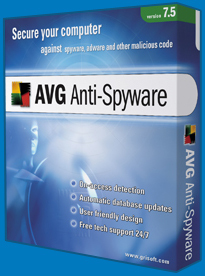 AVG Anti-Spyware is not much different from ewido anti-spyware except for a few additional anti-spy tools and a new colour scheme for the user interface. The resident shield also changed from the ewido networks logo to the Grisoft logo. AVG Anti-Spyware is your all-in-one anti-spyware solution.